One of two Amsterdam restaurants situated inside the lush Hotel Okura on Ferdinand Bolstraat in the City centre, the Ciel Bleu offers the quintessential fine dining experience in Amsterdam. 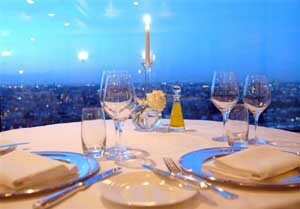 Located on the 23rd floor the restaurant has magnificent panoramas of the city centre and beyond. Chef Onno Kokmeijer�s menu is mainly French, in principle, but makes apt use of local produce to give it a special homely touch. Dishes like Thinly sliced lobster tail with lightly smoked sweetbreads and glazed garden snails with herb salad and vadouvan mayonnaise or Crispy cylinder of pumpkin caramel filled with salad of king crab are just a few noteworthy exemplars of the chef�s imaginative dishes. The winelist is lovingly selected with the Sommelier�s professionalism and close co-operation with the chef guaranteeing perfect harmony between wine and food. Such a balance has warranted the gift of the restaurants first Michelin star, matching the one restaurant Yamazato at the polar end of the hotel on the ground floor has. Service is professional, well presented and elegant, matching the timbre and d�cor of the dining room intrinsically. The perfect spot to escape the city with a loved one and watch the city fly by below.